Ferrocement rainwater storage vessels are an exceptional and innovative water containment option. 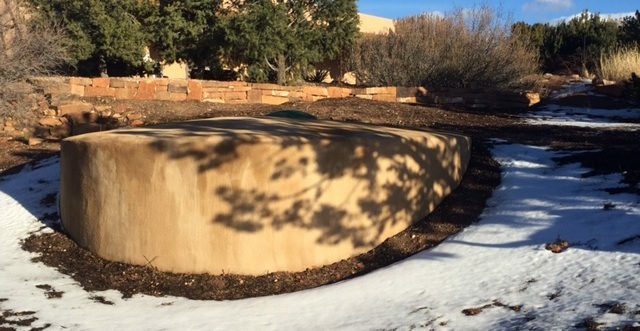 EcoScapes’ ferrocement cistern tanks are uniquely constructed and customizable, making them a particularly ideal choice where rainwater storage, visual appeal, and dual functionality (e.g. privacy, shading, separation of spaces or as a landscape retaining method) are important. EcoScapes’ ferrocement cisterns carry a structural engineer’s stamp and consist of a rich cement mortar encapsulating several layers of expanded metal mesh and steel reinforcing bars. 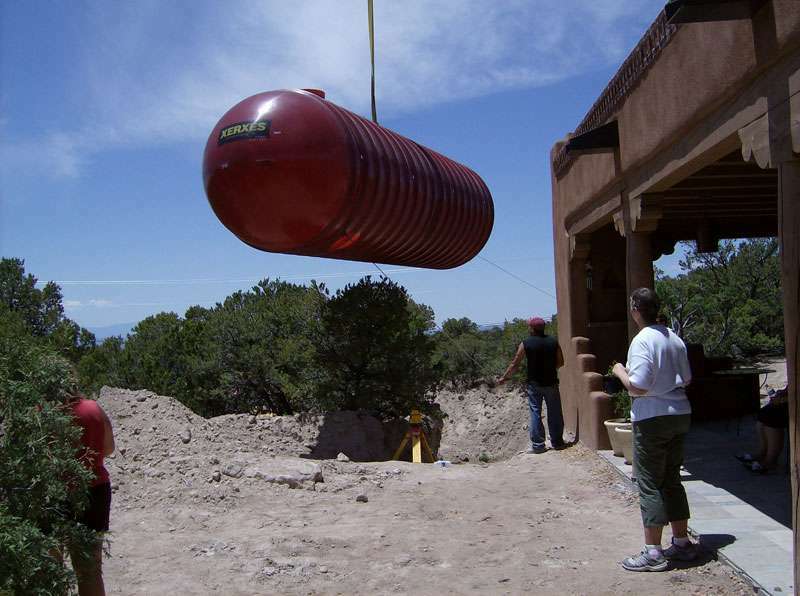 They can be installed in locations inaccessible to other large rainwater containers and will withstand the weather extremes of the Southwest for many years. Price – Ferrocement vessels are generally cost competitive with other means of rainwater storage on a cost per gallon of storage basis, especially for larger quantities. Durable – Strong, long-lasting, waterproof construction of super-rich cement mortar, mixed with a proven, non-toxic additive rendering it waterproof and self-healing if cracks appear. Local Jobs – Rather than purchasing polyethylene, steel or fiberglass containers from out of state, our tanks are constructed onsite from common building materials by hand. The cost of a ferrocement cistern tank is more in labor and knowledge than in shipping large, high-cost containers long distances. Design Options – Generally, these structural engineer-stamped cistern tanks are circular or spherical shaped vertical structures. Site specific solutions abound for adding visual appeal and functionality to a client’s needs when rainwater collection and storage is desired. They can be either completely covered and planted over or/ partially buried with the above ground sections serving other design functions. Microclimate Anchor – Vine bedecked and/or otherwise planted as the microclimate anchor of an interesting garden space. Outdoor Living Area – Back wall for an outdoor fireplace with integrated stonework or/ a partially covered outdoor kitchen or entertainment area – finishes are as simple or elaborate as desired. Foundation for a Deck – Hiding a ferrocement cistern under a planned backyard deck is a perfect ancillary use as the top of the vertical concrete and steel walls as support in lieu of independent pillars. Retaining Structure – Where retaining a hillside and rainwater storage are both desired, ferrocement cisterns can be an optimum design solution. Wall or Space Dividing Structure – Above ground portions of tanks can be tied into a stuccoed privacy wall or as a freestanding element dividing space. 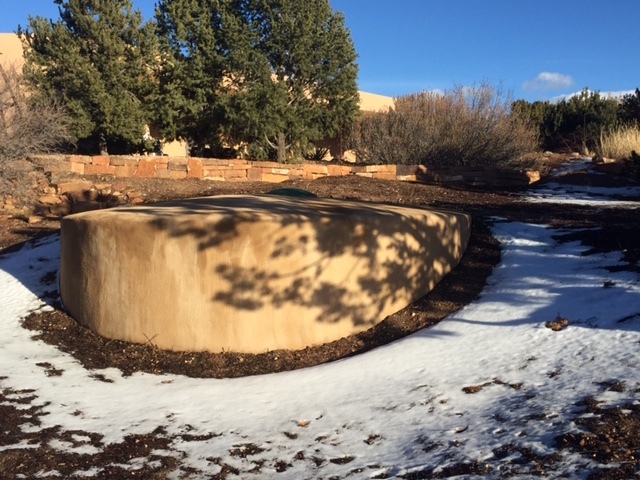 Underground Storage – A ferrocement cistern can be completely covered with soil and planted over with a vegetable garden, shrubs, grasses and/or other perennials. They can also be installed under areas where the plan calls for flagstone, brick, porphyry, gravel or other surface. EcoScapes people were totally awesome. They are flexible on design of landscaping, they work with you, and have great ideas that you see come into reality. We wanted both hardscaping, building (ramada/coyote fence) and softscaping - masonry and plantings and trees, plus the irrigation systems - they do it all! We had a tough space to put in two 1200 gal cisterns and they got it done. Very responsive in terms of scheduling & completion and reliable. Environmentally they are top grade - aware and careful. The irrigation system is amazing & tailored for our plantings/trees. Quality - We get a million compliments on how our patio looks, and we love it! We are already thinking of our next project with them. Maximize the water resources that flow through your property! EcoScapes of Santa Fe was founded in 2001 with an inspiration to create a full-service landscaping company that designs, builds, and maintains beautiful landscapes, while remaining mindful of the local ecology and limited water resources. Santa Fe Landscape Contractor. Design. Maintenance. Water Harvesting.